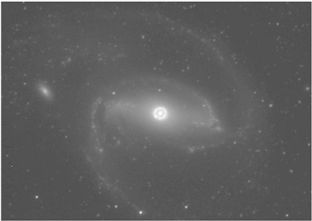 This example demonstrates how to use MOPEX to create mosaics of a large field of view around the SINGS Legacy Science Program’s galaxy NGC 1097 in IRAC channels 1 through 4. We pay special attention to choosing the appropriate parameters in the MOPEX namelist files, and discuss the effect of various choices of several of these parameters. The final products include the mosaic image, the mosaic uncertainty image, and the mosaic coverage map. Note that this example uses the command line way of running the mosaicer instead of the GUI that was used in previous sections. You must have MOPEX installed in order to follow along with this recipe (http://irsa.ipac.caltech.edu/data/SPITZER/docs/dataanalysistools/tools/mopex). Download the BCD and calibration data for channels 1 through 4 from AORs 5515776 and 5516032. Put all the data into directories of your choice - you can choose to rearrange the directories that the Spitzer archive sets up for you, for example, by combining all of the BCD data from two AORs into one directory. You also need a similar list of the corresponding uncertainty files (*cbunc.fits files) and imask files (*bimsk.fits files). 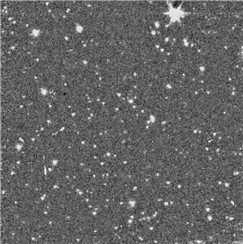 You can also simply type “ls *cbcd.fits > filelist.txt” and edit out the short exposures, (e.g., keep SPITZER_I1_5515776_0001_0000_4_cbcd.fits but delete SPITZER_I1_5515776_0000_0000_4_cbcd.fits, keep SPITZER_I1_5515776_0003_0000_4_cbcd.fits but delete SPITZER_I1_5515776_0002_0000_4_cbcd.fits etc.). Do the same for the uncertainty and imask files. Do not forget to also download the IRAC Pmask files (http://irsa.ipac.caltech.edu/data/SPITZER/docs/irac/calibrationfiles/). that you can use to get rid of any remaining artifacts in the CBCD images before making the mosaics. It is recommended that you run the frames through an overlap correction module before proceeding with mosaicking. These parameters are used in the outlier rejection to set the upper and lower limits (multiples of sigmas), and the minimum number of images needed to perform the overlap correction. Also remember to set COMPUTE_OVERLAP_CORRECTION = 1 and APPLY_OVERLAP_CORRECTION = 1 in the namelist file. Finally there is a parameter MASK_BRIGHT. You can set this to 1 to use masks created by the ‘‘detect'' module. 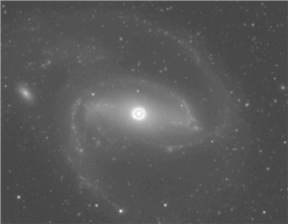 In this example, the central parts of the galaxy are very bright, and adjusting the parameters to detect less bright objects only did not help to avoid the masking of the brightest galaxy parts, and therefore the MASK_BRIGHT parameter is set to 0. You can experiment by running the overlap correction module with MASK_BRIGHT set to 1. In addition, the first frame of an AOR often has a bias offset which is very different from the rest of the frames in the AOR. 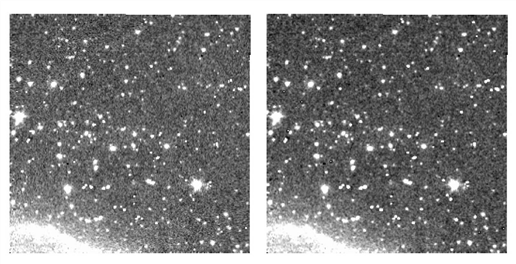 In this example, we leave the first frames (EXPID=1) in channel 3 out from both AORs in generating our overlap-corrected frames and mosaics. Most of the rest of the parameters specified in the namelist of the overlap correction module are discussed below in the context of generating the mosaics. Remember that your IMAGE_STACK_FILE_NAME when making the mosaics below must point to a file that specifies the overlap-corrected filenames (and their path on your disk; filenames starting with ‘‘correct_SPITZER'), not the original CBCDs. Also note that the option MOSAIC_CORRECTED_IMAGES will only give a quick and dirty mosaic to see whether the overlap correction worked okay. A thorough mosaicking with the mosaic.pl script, as described below, is necessary to produce a high quality mosaic. Edge_pagged = 100 Add 100 arseconds of NaN-valued pixels on each edge. CROTA2 = A Orient the final mosaic. Use A for average CROTA values of the input CBCDs, 0 (‘‘zero”) for north up orientation. If not specified, an optimal orientation is used that minimizes the area covered by the mosaic. -0.00016667 Set the pixel size of the mosaic. Subtract the background in the input images. Trying a larger Window size (and larger outlier number) does not produce as good results. Trying a smaller Window size did not remove the background. 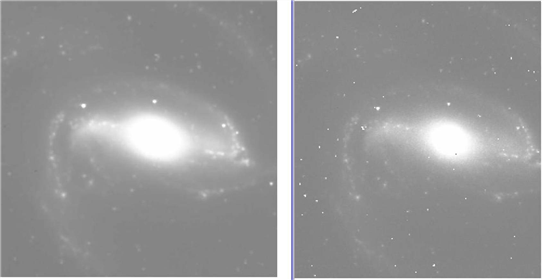 Ch 1 BCD (left) and Ch 1 image after background subtraction (right). Interpolate the output pixels based on input pixel values. It is also possible to do drizzling (INTERP_METHOD = 2) or bicubic interpolation (INTERP_METHOD = 4). For drizzle, specify drizzle factor (DRIZ_FAC < 1). In channels 3 and 4 a better mosaic results if the FINERES parameter is not used, or if you use drizzle or bicubic interpolation. Interpolation using the default option (left) or drizzling (right). Try playing with the threshold parameter. Increasing it causes a lot of cosmic rays to not be detected. Lowering it causes too many detections. Leave it at 4. Play with MAX_OUTL_FRAC. Increase it to 0.95. You will see a lot of non-radhit detections. If you lower it to 0.2, very few detections are seen. The best value seems to be 0.5. Tile size parameters can be played with if your computer has problems with insufficient memory. For run_level the parameter is THRESHOLD_RATIO. Use 0.5 to have all the pixels within a cluster to have the same sign (see mosaicker user's guide for more info). Trying a box size of 5 to enlarge the spatial comparison area did not provide a better outlier rejection, so we leave the box size at 3. The dual outlier flagged pixels are used in the Rmask if an output pixel has been covered fewer than by MAX_COVERAGE input images. BOTTOM and TOP thresholds are not used in our example (they are only used for the temporal outlier method). The refinement parameters are not relevant for our example either. Decreasing the box thresholds to 3 produces too many outliers that do not correspond to real cosmic rays. 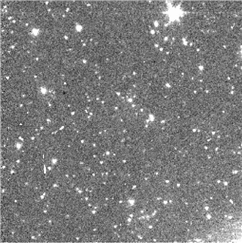 Final mosaic after cosmic ray rejection (left), one of the original CBCDs (right). Pipeline-created mosaic in channel 2 (left), custom-tailored mosaic (made in this recipe; right). CAVEAT EMPTOR: More optimally constructed mosaics may possibly be constructed by using a different set of input parameters in the namelists. Use your own judgment and common sense.